It was a debate which had been contested for many weeks amongst many Welshmen. The debate over who should be included in a 34-man squad to tackle the Southern Hemisphere giants in Cardiff has raged for many weeks with individual performances from the Pro12 being heavily analysed and scrutinised in equal measure. So who made the cut, and more importantly did Gatland make the right call? Less than a year out from the World Cup in England, this squad selection in all likelihood, remained the last chance for many youngsters and fringe players to force their way into Warren Gatland’s thinking. Ultimately, the inclusion of one uncapped player – 20-year-old Osprey prop Nicky Smith – tells you that Gatland will once again put his faith in the players who made up the core of the last World Cup in 2011 and the subsequent domestic triumphs of 2012 and 2013. A brave call perhaps, but one that on paper at least looks justified. Roll back the clock to 2011 and Welsh rugby was not in the greatest of shapes. Following the glorious first year of Gatland’s tenure in 2008, where a Six Nations Grand Slam was secured along with a rare victory over Australia in the autumn, the national team’s performances slowly deteriorated. Coming into a World Cup year in 2011, Wales’s chances of merely progressing from a tough group including reigning champions South Africa, Samoa and Fiji looked slim. However, after some mesmerising performances including a wonderful victory over Ireland in the quarter-finals, Wales eventually finished the tournament fourth, following narrow defeats to France and Australia. Following such a surprising turn-around in fortunes the national team returned to dominate Northern Hemisphere rugby with consecutive Six Nations titles along with many of the players making up the core of the successful British and Irish Lions tour of Australia in 2013.This success was brought about by the decisions made leading up to the last World Cup from the coaches to bring in youngsters such as George North, Dan Lydiate and Taulupe Faletau, with all three going on to be key performers for both Wales and the Lions. However, Gatland has chosen to go with continuity in terms of squad selection leading up to the forthcoming World Cup. With the exception of the likes of Smith, Samson Lee and Hallam Amos, Gatland has kept faith with the players who have brought so much success since the last World Cup. The integration of young players such as Hallam Amos, Dan Baker and Rhodri Jones into the fold will ensure that the squad has a fresh feel about it, a factor which should help to make sure that complacency does not set in amongst the squad leading up to England 2015. The squad itself is what many people expected, but there were a few shock omissions. The fact that Gatland has left two former Lions, Adam Jones and James Hook, out of the squad shows how fierce competition for places has become. The absence of Jones may be less of a shock given his struggles with the new scrum laws, but the absence of fly-half Hook is one decision that has left many Welshmen, including myself, surprised. Hook’s form since his summer move to Gloucester has been mightily impressive with his quick-thinking and equally quick hands getting the best out of a promising backline which is beginning to prosper under his exciting guidance. With Dan Biggar’s improvement at the Ospreys making him favourite for the no.10 jersey, it seemed a straight fight between Hook and the Scarlets’ Rhys Priestland. Gatland’s decision to go with Priestland has angered many who continue to believe he has shown too much faith in a player who has struggled to perform at test level. Other surprise omissions include Eli Walker of the Ospreys who lost out to Dragons wingers Hallam Amos and Tom Prydie respectively, former Lions lock Ian Evans and Leicester Tigers’s Owen Williams, who has been excelling in the Tigers’ midfield as well as at fly-half. 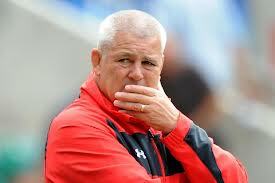 Overall head coach Gatland has once again stuck to his guns and has seemingly put his faith in experience over youth. Given the exciting young players coming through for both England and Ireland, this tactic may prove an unmitigated disaster or a tactical masterstroke, leading up to arguably the most open World Cup in history. ← Saints go marching on!